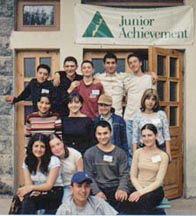 Guided by our basic belief in integrity and excellence, Junior Achievement of Armenia embraces an active approach to transforming the lives of Armenia’s youth. To educate and inspire young people to value free enterprise and civil society. Empowering young Armenians with the skills and knowledge to compete and succeed in tomorrow’s world. This is the challenge that JAA takes on with creativity, innovation and action. With nearly 1,000,000 graduates, the impact of our programs extends far beyond Armenia’s borders. Today we are playing a vital role in promoting global cooperation and peace.